Whether it's a stripped-down streetfighter, a bling bike covered in chrome and LED lights, or a stuntbike built for acrobatic maneuvers, pro streetbikes are the hottest custom bikes on today's scene. As the price of used motorcycles comes down, and the availability of aftermarket parts and accessories goes up, it's only natural for the most creative builders in the world to find more and more ways to create incredible horsepower while pushing style to the limit. 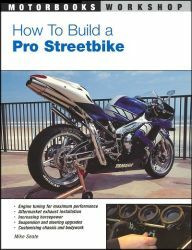 In How To Build a Pro Streetbike, noted motorcycle journalist and author Mike Seate outlines five popular streetbike builds and explains how to assemble them yourself while maintaining a budget. A hot Hayabusa gets chopped and restyled. A Honda RC51 gets pumped up and modified to become a dual-purpose street-and-track machine. A GSX-R1000 loads up on bling and eye candy. And finally, a Honda CBR600RR loads up on safety gear and performance parts for stunt maneuvers. Foreword: Custom Sportbikes—The New Choppers? Filled with color photography of each build and many examples of other pro streetbikes, How To Build a Pro Streetbike is the perfect companion to a custom build of your own.